Maybe I haven't said this enough, but I am a freakin' huge wrestling/rastling ever since I was a kid. Part of that is because my dad was a luchador when my family still lived in Mexico City. He went under the stage name, "Chamaco Montezuma" and he was moving forward with his amateur career, that is until two things happened. One: during a match, another guy took him out by way of dislocating his shoulder on a routine move. Second: I was born and with a family to support/being injured, he had to figure something out job wise. I've grown up on both Mexican and American wrestling over the years and have never stopped loving it. Fact of the matter is, I've learned to appreciate it as I grow older and crave for it sometimes. At its heart, wrestling is a kind of sports-theater. The elaborate costumes, trash talking and mask are all part of the show and mistic that goes along with this over dramatized soap opera. Part of the theatrics used on story lines often mirror those of events happening in mainstream society, and on this occasion, it's immigration reform. This is something that isn't new to the world of wrestling. The WWE currently has an on going story line between two wrestlers, one being against immigration and the other being an immigrant himself. Ironically enough, the Daily Show got on this and they have a hilarious bit with legend Mick Foley. So, if you have a problems with immigrants, you have a problem with Mick Foley son !! 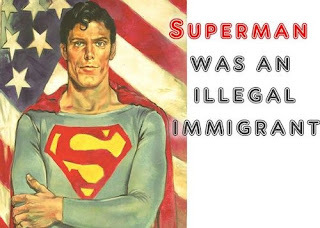 It’s easy to see how and why Superman can be considered an undocumented immigrant. His origins mirror those of anyone forced to relocate from their home country to another because of outside factors and in Sup’s case, a dying planet. For decades, he’s embodied the spirit of America by upholding truth, justice and the American way, reflecting the origins his original creators had in mind and those placed on him by society throughout the years. And while the details of who Superman is and how he got to earth have wavered, the fact remains that he is from another planet and he grew up in the United States, just like me. That is, if you consider Mexico another planet. 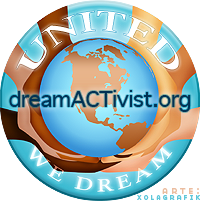 I’ve lived in the US for 21 years as an undocumented immigrant and assimilated to the point of surpassing numerous negative stereotypes and low expectations placed on Latin American immigrants by US culture and society. Like Superman, my views on society have grown and changed over time to see the inherit connection between all people of the world. Politics, policies and/or wars know no borders when it comes to creating situations in which individuals have no other choice but to migrate for a better life. When parents are faced with the choice between death and a better life, they’ll do whatever is needed to protect their children. Just as Superman’s parents did with him and my parents did with my siblings and me.